the newsletter of the Beau Monde chapter of Romance Writers of America. We historical writers strive for accuracy in our stories: the sights, sounds, smells, and general attitude of a specific place during a specific time. Research books, web sites, museums and many other sources are available to us, but the most compelling, although expensive, of all research tools is an actual site visit. So how do we get the most from visiting the actual locale of our stories? As I meandered through the cottages, the garden and the workshops in the Ruddington Framework Knitters' Museum. Ruddington, south of Nottingham, Notts. I felt a powerful connection to the stockinger's lives. A purpose-built knitters' yard, the original buildings were constructed in 1829, and typified the transition period from cottage industry to factory. I marveled at the seats each knitter had hand carved to fit his individual posterior and which he moved when he sat at a different frame. Volunteers demonstrated how to knit tubular stockings on the frames, making me understand the process in a way no written account can. Stockings from the 1820s were on display. 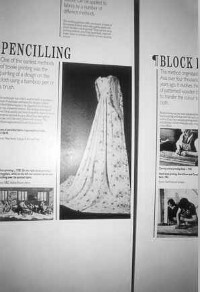 Framework knitting workshop at Ruddington. Note handcarved seat at front right. Photo by Rein Laik. 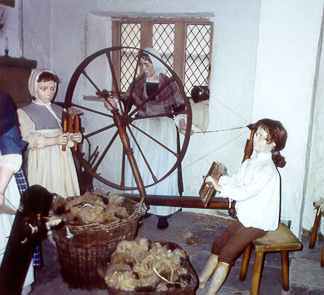 In museums that were former mills, replete with the machines that dominated the lives of a vast number of English men, women and children. I'd read about the "dust"--fine lint from whichever fiber was being processed--which gathered in corners and niches, in and around the machines, and floated like a mist in the air when the machinery was operating. In these places it seemed I could "see" the children. Those who carried away the containers of "rovings"--the soft ropelike cotton spit out of the combing machines--and brought them to the spinning machines. The children whose quick hands twisted together the ends of the threads when they broke. And the little "scavengers"--children whose task was to crawl under the machines, while they were operating, to pick up the lint so it didn't clog the workings. Bradford Industrial Museum and Horses at Work, Bradford, Yorkshire, West Riding. A well-organized museum; most of the exhibits post-Regency. Galleries include: Linton Engine Gallery. One of the last steam engines manufactured in Bradford and displays of the history of steam power. 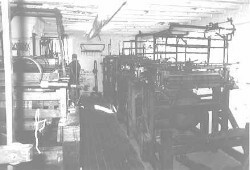 Worsted Textile Galleries, which includes Spinning Gallery demonstrating preparation of worsted yarn from raw wool and Weaving Gallery where spun worsted yarn was prepared for looms, and weaving process. Helmshore Textile Museums, Helmshore, Rossendale, Lancashire. Has many interactive displays, demonstrations. While we were there, several groups of schoolchildren came through. The museum's brochure mentions the difficulty of finding competent operators to demonstrate the machinery, and one of the elderly guides complained to me that no one was "in training" to replace him. He touched me with his pride about his knowledge. Cottage industry diorama at Helmshore. Brother and sister carding wool. Photo by Judith Laik. Macclesfield Silk Museum, Macclesfield, Cheshire. The museum is in two buildings. The Heritage Centre and Silk Museum, a building dating from 1814, originally constructed for a Sunday School for child workers in the silk mills. The school was actually begun much sooner, in the late 18th century. The building now houses a costume display, but little dates from the Regency period. The other building houses Paradise Mill, with guides telling of the development of the silk industry. There are restored jacquard handlooms. Volunteers demonstrated the operation of the looms. Our guide showed how the designs were made and then punched on cards to instruct the loom how to weave the pattern. A brochure, "Macclesfield Silk Trail," which I picked up at the museum, had a self-guided tour of relevant sites in Macclesfield, workers' homes, other mills, etc. When I made my trip to England, I had already done a great deal of research on the Luddites for my book The Lady in Question, which has the Luddite revolt as its background. I didn't need more facts about those events. What I wanted was a feel, some landscape. To put the bare facts in the context of actual places. 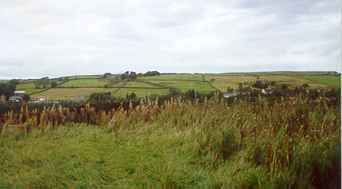 Yorkshire landscape in the Pennines. Photo by Judith Laik. Because I had no idea beforehand what was there to see, I did some research on the internet prior to going on the trip. For anyone planning a research trip, I recommend doing research, through the internet and in the library, to gain as much information as possible beforehand. You can save time, gain a better idea of where to go and how to schedule your trip, and discover places to see you might not have thought of otherwise. On your trip, take notes, including notes about photographs you've taken. I wrote details, sounds, scents, and textures in my notebook. Even if you don't use them for the book you're currently researching, you never know what you may be writing in the future. Not all museums allow photographs to be taken inside, but if they do, plan to take a lot. I photographed the signs describing many of the displays, knowing some of them might not be readable--although I've found that many that look blurry or too small to read can be read with a magnifying glass. Photographs of the signs can save you from having to remember just what display this was, and often give more information than your hasty notes can convey. By all means, visit the gift stores that most museums have. You'll find them a great source of additional research--history or more full descriptions of the topic. If your schedule has some flexibility, you'll also find brochures listing other attractions in the area, which your online research from home may not have told you about. When visiting museums, contact them ahead of time if you can. Even if you have information from a web site, it may not be up to date; hours of operation may differ from what you expect. And, sadly, many of them are operating with little financial support. Some museums I had intended to see were no longer in existence by the time I was there. There is also the difficulty, mentioned above, of finding knowledgeable volunteers to demonstrate the machines' operation. Despite the lack of time for my trip, and not realizing how flexible I needed to be, I highly recommend this method of research. There is no substitute for seeing and handling the actual item, when permitted. No book or web site can convey the enthusiasm that the volunteers show and share every day. Judith Laik is the author of two Regency romances, The Lady Is Mine and The Lady in Question, an August release from Zebra Regencies. Traveling to the UK is one of her favorite activities, besides writing, reading, and playing with her dogs. Check out her website, www.judithlaik.com.